The International Astronomical Union (IAU) – the internationally recognized authority for naming celestial bodies and their surface features – has approved themes submitted by NASA's New Horizons team for naming surface features on Pluto and its moons. In 2015, NASA's New Horizons spacecraft delivered the first close-up views of Pluto and its five moons – amazing images of distant and surprisingly complex worlds, showing a vast nitrogen glacier as well as ice mountains, canyons, cliffs, craters and more. The IAU's action clears the way for the mission team to propose formal names for dozens of individual surface features. "Imagine the thrill of seeing your name suggestion on a future map of Pluto and its moons," said Jim Green, director of NASA's Planetary Science Division in Washington. "Months after the Pluto flyby, the New Horizons mission continues to engage and inspire." This composite of enhanced color images of Pluto (lower right) and Charon (upper left), taken by NASA's New Horizons spacecraft on July 14, 2015, highlights the wide range of surface features on the small worlds. Working with the New Horizons mission team, the International Astronomical Union (IAU) has approved the themes to be used for naming the surface features on Pluto and its moons. Working with the New Horizons team, the IAU has agreed to naming themes (listed below) for Pluto, its largest moon, Charon, and its four smaller moons—Styx, Nix, Kerberos, and Hydra. Some of these themes build on the connection between the Roman god Pluto and the mythology of the underworld. Other themes celebrate the human spirit of exploration. As a precursor to the naming process now underway between the IAU and New Horizons, in early 2015 the IAU endorsed the NASA-New Horizons led "Our Pluto" naming campaign, which allowed the public to participate in the exploration of Pluto by proposing names for surface features that were still awaiting discovery. That campaign was a partnership between the mission, NASA and the SETI Institute, of Mountain View, California. 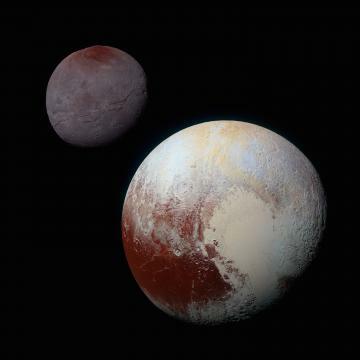 "I'm very happy with both the process and partnership that New Horizons and the IAU undertook that led to wonderful, inspiring, and engaging naming themes for surface features on Pluto and its moons," said Alan Stern, New Horizons principal investigator from Southwest Research Institute, Boulder, Colorado. "We look forward to the next step—submitting actual feature names for approval." "We have been delighted to be able to share the excitement of the New Horizons mission with people from all over the world," said Mark Showalter, a senior research scientist at the SETI Institute and the New Horizons team member who organized the "Our Pluto" naming campaign. "I look forward to seeing many of the public's thoughtful suggestions officially assigned to the maps of Pluto and its moons." After voyage of more than nine years and 3 billion miles, New Horizons made history by flying through the Pluto system on July 14, 2015, returning data that have transformed our view of these intriguing worlds on the planetary frontier. Next up for the spacecraft is a flyby of another Kuiper Belt object, identified as 2014 MU69, on Jan. 1, 2019.